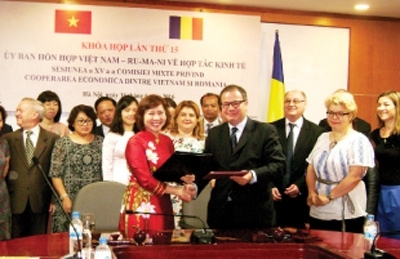 (VEN) - The long friendship between Vietnam and Rumania provides a good basis for the two countries to develop economic ties. Vietnam and Rumania are experiencing a golden period for boosting investment and business cooperation. However, it is necessary for businesses of the two countries to find and make the most of opportunities. Bilateral trade between the two countries has grown in recent years exceeding US$100 million in 2010 and has grown continuously in the last five years. Vietnam and Rumania celebrated 65 years of diplomatic relations last year marking a path of sustainable cooperation and development. Bilateral trade increased by 16.2 percent from 2014-2015 reaching US$175.641 million. Of this, Vietnam sold US$102.208 million worth of goods to Rumania, a 1.98 percent increase, and bought US$73.433 million from this country, a 41.48 percent increase. Trade revenue reached US$46.147 million in the first four months of this year, including US$31.596 million worth of Vietnamese exports to Rumania and US$14.551 million worth of Vietnam’s imports from this market. Vietnam has sold coffee, seafood, garments, footwear, electronics and computers to Rumania, while buying wheat flour, machinery, spare parts, chemicals and iron and steel materials. 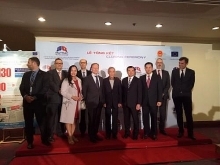 In terms of investment, by the end of April, Rumania had three investment projects with total registered capital of US$2.1 million in Vietnam. This figure however is far from commensurate with the great potential that exists. At a Vietnam-Rumania Business Forum held recently in Hanoi, Vietnam Chamber of Commerce and Industry Deputy General Secretary Nguyen Quang Vinh attributed the modest trade to insufficient information, advertising, geographical distance, high transport costs and difficulties in terms of customs and payment procedures. The governments of the two countries are trying to overcome shortcomings and make the most of potential. At the 15th meeting of the Joint-government Committee held recently in Hanoi by the Vietnamese Ministry of Industry and Trade and the Rumanian Ministry of Economy, Trade and Business Environment, the two parties agreed to focus cooperation on trade, energy, industry and agriculture. They also confirmed to provide the best conditions for businesses to access mutual markets and encourage investment in strong areas in both countries. The Romanian State Secretary of the Ministry of Economy, Trade and Business Environment Vlad Vasiliu, said that with a population of 21 million Rumania is the largest market in Southern Europe and an attractive destination for investors. The country is the center of three European economic corridors and has favorable conditions for ocean shipping within the EU. Rumania has more than 130 direct air routes to EU countries, while providing good infrastructure, high-speed internet access and good fuel prices creating competitive advantage for economic, trade and investment development in Rumania. In addition, when compared with other countries in the EU, Rumania has a cheap but skilled labor force and a full range of preferential taxes. Rumania also has strength in oil and gas, petro-chemistry, architecture, construction, seaports, medicine and agricultural processing. Rumania expects to find opportunities to invest in potential areas like high technology, electronics, electric technology, telecommunications, information technology, agriculture, oil and gas in Vietnam, said Vlad Vasiliu. According to Nguyen Quang Vinh, Vietnam and Rumania currently have huge opportunities to promote trade and investment cooperation. In particular, after the free trade agreement between Vietnam and the EU is concluded, it will become a driving force for the development of bilateral relations between the two countries. To strengthen exports and imports, businesses of the two countries need to be active in accessing mutual markets, establishing direct partnerships, building trust among partners, increasing marketing and advertising, and looking to cooperate in strong areas. When securing export contracts, Vietnamese companies should pay attention to ensuring stable supply, regularly renewing product design, improving product quality and promoting R&D activities.